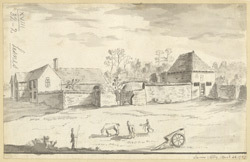 View of a farm at the site of the former Lesnes Abbey in the parish of Erith in Kent (now in the London Borough of Bexley). It was established in 1178 by Richard de Lucy, as an act of penance for his part in the murder of Thomas Becket. It was a small community and never very wealthy. In 1525, it was suppressed by Cardinal Wolsey, who gained permission from Pope Clement VIII to dissolve houses of less than eight members. The revenues were to support Cardinal Wolsey's College in Oxford. Soon after the buildings were comprehensively dismantled for their building materials . By the late 18th century, it had been bequeathed to Christ's Hospital in London. As this drawing shows by this time there was a farm house here.